These are the Ovation guitars that I had have sold. Two of them are really missed, the Anniversary 1657-8 and the natural Elite. The rest went (always for a budget price) because had an issue. The list is in order of sale date. My very first Ovation, bought in 1977 in Hong Kong and sold two years later. No big deal of a guitar, but I paid it less than $ 100 including a beautiful brown hard case. I sold it to buy a wood neck Ovation, the alluminum neck felt weird. 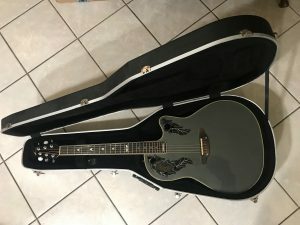 My first real Ovation, bough after selling the Matrix. Had a nice mid depht bowl and a good sound. I traded it in the early Eighties to buy the Anniversary 1657-8 (today missed). 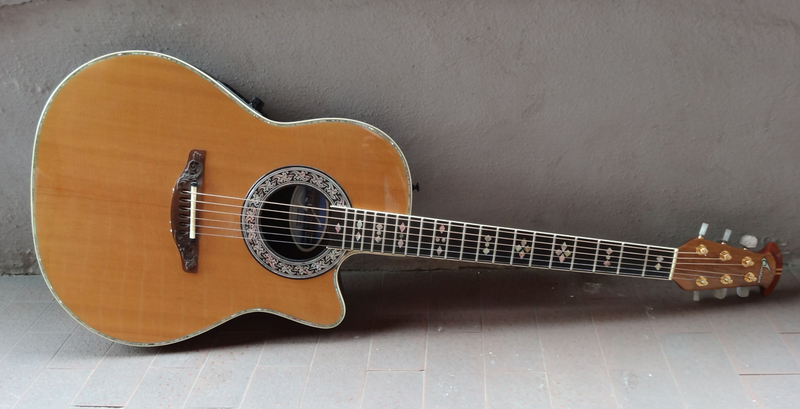 My third Ovation, bought in a now deceased famous Milanese guitar store trading in the Artist and adding extra money. It had a gorgeous tigght vein orange top and an awesome neck. Sold in the mid Eighties when I was too young to understand how special it was. Big mistake. My first wood top Adamas-style Ovation, sold in the early 2K. Lots of fun to look at, but with a significant neck problem so I sold it. I bought this guitar on eBay in early 2019. Described as “mint”, in fact had a finish crack on rear of the neck. There were also three superficial finish scratches on the back, near the neck body joint, that the previous owner had touched up with a marker. It also came with a full depth Ovation case, in spite of being a super shallow guitar. The electronics worked, but the control plate screws were rusted. The paperworks were missing. For these reasons I asked a partial reimburse and sold it for the amount I actually paid in November 2018. I must say that after seeing it I decided that I do not like this model, so I will not search a cleaner one. Celebrating the first ten years of guitar building (1966-1976), The Anniversary is in my opinion one of Ovation’s best projects ever. A discrete yet elegant, nice looking, playing and sounding guitar, offered from 1978 to 1982 in this “antique brown” (actually a reddish aged transparent stain) and in “natural”, both in acoustic (1157) and electric (1657) versions. The Anniversary has exclusive snowflake inlays on the ebony fingerboard, multi layered headstock overlay (as on the Adamas 2), exclusive herringbone binding and rosette inlay (later used on the 1991 Collectors), carved bridge and trussrod cover (as on the Custom Legend). I found this pure acoustic in late 2013 on the OFC forum (thank you Jim) that produces a huge sound, with powerful basses, solid mediums and clear highs. It has a thin finish, non structural crack in the middle of the top so I put it for sale at a very reasonable price and sold it in 12 hours, December 2018. The Custom Legend 1869 was born as a shallow bowl, cutaway version of the reverend Custom Legend. It has all the gorgeous fancy appointing of the full bowl version, an awesome AAA Sitka spruce top and a super comfortable neck. A perfect onstage guitar that maintains a more than decent acoustic voice. I bought this beautiful 1869 in May 2014, as a first reaction to the closure of the historical plants of New Hartford, CT by Fender Musical Instruments. 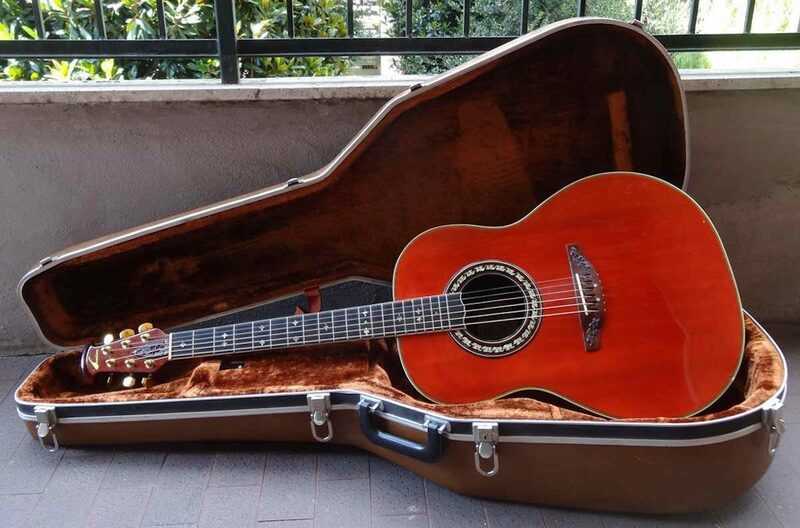 Seen on Craigslist, it was so clean and the price so reasonable that I decided to bring it home, although at the time I was still looking for the best 1619.According to the dating page of the Ovation Tribute website it has been made in 1986. Not a scratch, not a sign of wear, in spite of almost 30 years of life. And what’s best, despite the shallow bowl, this guitar produces a well balanced and quite powerful acoustic voice. Plugged in it takes advantage of the OP-24 preamp, considered by many the best acoustic guitar amplification system.The soundboard is beautiful, obviously with some waving and a minor hairline finish crack, an Ovation trademarks, that I keep under control with a constant attention to the correct humidity in the case.The inlays are stunning as on every CL. An instrument easy to carry around and very pleasant to play. Sold to Adam in March 2019 through the Ovation Guitar Player Community page on Facebook after deciding to focus my collection to limited and rare models. In spite of being a non strictly roundback all-wood guitar, this EA68 Viper is 100% an Ovation so I decided to get in touch with the guy who was putting it for sale, in spite of not playing live or recording anymore. I wanted one because Glen Campbell was playing it and because I still miss my Gibson Chet Atkins SST. The Ovation Viper is a small and good looking guitar, so silent when not unplugged that I can strum it late at night. I bought it in August 2018 at a very reasonable price. Near mint, it is one of the first EA68 built and came with a set of Grover Imperial-style Schaller tuners instead of the standard Ovation-Schallers. According to the seller they have always been there, but I replaced them with a gorgeous set of Schaller pearloid buttons bought from StewMac and I also have a set of original gold buttons from my Ovation buddy Paul Templeman. The neck is awesome, with a low action and a lot of frets out of the body (which I will not use, because I tend to play in the cowboy positions) and the amplification system is essential but efficient, so I can get a credible acoustic sound when plugged in my small Yamaha THR-10 home amp. Playing it is a lot of fun. And it’s made in New Hartford, CT, in the Kaman era, as any Ovation should. But… I seldom play plugged in and when I do I prefer a mid-bowl guitar with an OP-24, so in April 2019 I swapped it for a 1995 Collectors with an Ovation friend who lives in texas.